Djedkare-Isesi, 7th ruler of the 5th dynasty, built his pyramid called 'Beautiful is Djedkare' at South Saqqara 3km south of the Step Pyramid of Djoser. Djedkare ruled for at least 32 years and was succeeded by his son Unas the last king of the fifth dynasty. The locals call the the pyramid el-Shawaf, 'The Sentinel', for it stands on a high spur overlooking the village of Saqqara. Egyptologist have yet to explain why Djedkare-Isesi built his pyramid 6Km south of Abusir, a 5 dynasty necropolis. Tombs of his daughter, his son, and a few of his officials were discovered in the 1970's by a Czech team exploring south of Niuserre's causeway. At the Northeast corner of the wall surrounding Djedkare's pyramid and mortuary temple lies another, smaller pyramid complex. Because of its position it is likely a consort of Djedkare. The owner of the pyramid is unknown, although excavation in the area is not complete. It is known as 'The Pyramid of the Unknown Queen'. 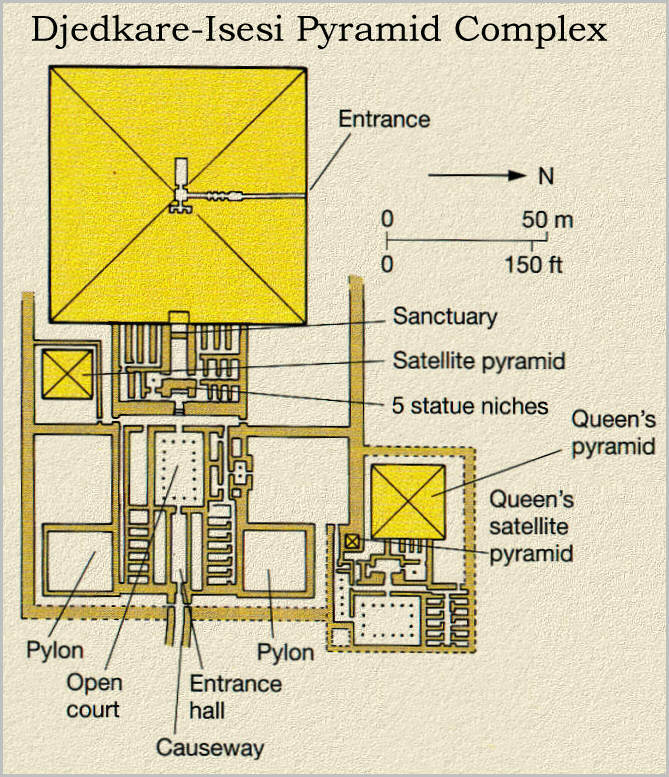 The entrance to the pyramid can be found on the north side in a chapel and is entered from the pavement. The mortuary temple. Located on the east side, has many granite blocks with the names of Djekare-Isesi still in situ.